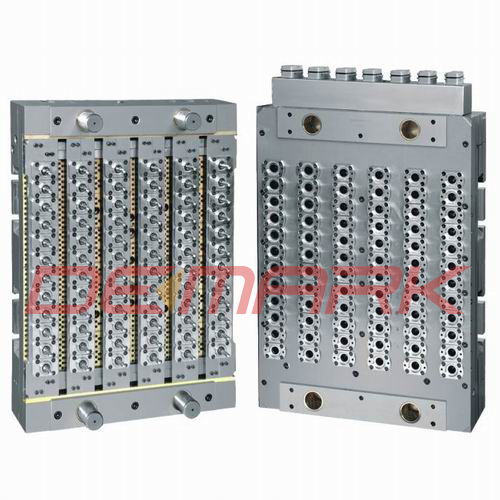 Demark Machinery, specialized in manufacturing 72 cavities PET preform moulds injection molding system, consists of technologists with rich experiences, and senior engineers with master's degree and professional in 3D. We invite many technical committee members and senior professors in mould line are as the technical consultants for our company. With the powerful team for research and development, we are capable of manufacturing the PET preform moulds with one cavity to ninety-six cavities, which include the injection system. At the same time, we can manufacture preform moulds especially according to customer’s injection molding machines. The PET preform molds feature the no-cutting valve gate to reduce the labor cost, and advanced hot runner system to assure lower level of AA value. Moreover, the reasonable-designed cold water channels increase cooling effect and shorten the cycle time. 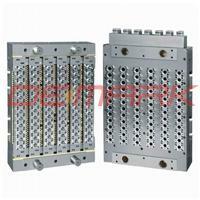 These advantages are reasons for you to inquire our PET preform moulds. The main components of preform molds are made of S136 material (Sweden ASSAB), and the mold base is made of imported P20. The plate method avoids corrosion efficaciously and assures long life service of the preform molds. Various kinds of processing equipment and detection measurement instrument are imported, as well as special drawing soft is applied in designing performs, samples and manufacturing testing mold. We supply special technology training and other good after-sales service. If you are interested in inquiring our PET preform moulds, please do not hesitate and contact us today for more information! We are ready to serve you both quality products and services.